We’ve all been there. Whether it’s that time of the month, or we just ate the wrong thing. Yup, I’m talking about stomach bloat. That tight, gassy feeling can affect you at the worst moments, and it almost feels impossible to get rid of. The good news is, there are ways! It ‘s all about what you put into your body. It won’t be easy, but getting rid of bloat is possible. For more, be sure to read on and let me know what you think in the comments section. How do you take care of your body? Let me know! Avoid Constipation– It’s common knowledge to exercise, eat lots of fiber, and drink water, yet we don’t do it. What’s the deal? Eating 25 grams of fiber a day will kick start you in the right direction. If you’re on a low fiber diet, you aren’t going to get anywhere, and that constipated feeling is just going to get worse. Remind yourself to drink water throughout your day and add 30 minutes of physical activity. This should help. 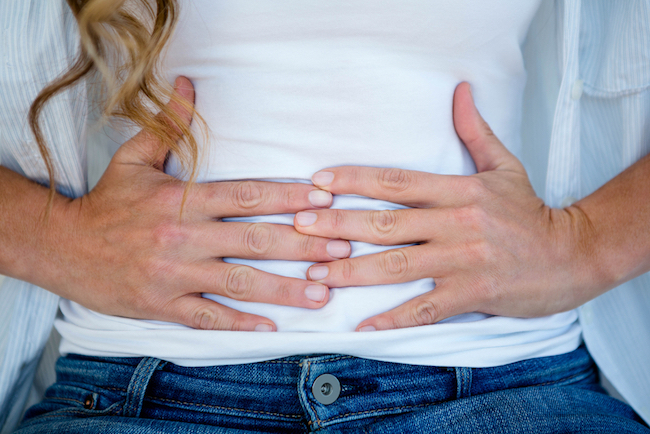 Food Allergies– Your stomach bloat might be due to a food allergy. If you know your body doesn’t react well to a certain food like dairy, you might want to see your doctor for tests. This way you know what foods to eliminate from your diet. Eat Slowly- Eating too quickly and not chewing properly can cause you to swallow air which leads to—you guessed it, stomach bloat. Meals are meant to last 30 minutes, so one way to help you with bloating is to eat slowly. Chew with patience. Eat mindfully, people!